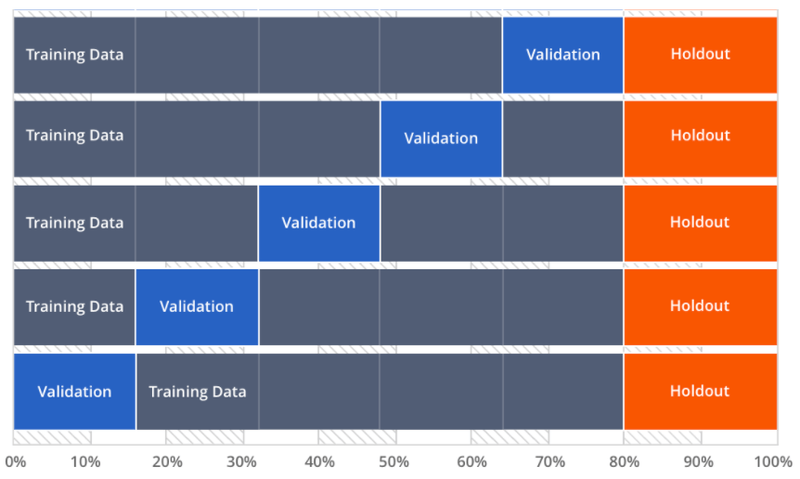 Many deep learning tutorials are designed with two datasets: one for training and one for validation. We train our model on the training set, and evaluate the model on the validation set. The “Hello World” datasets, such as MNIST, Cifar10, and so on, all come with two datasets. What if we have only one big training set? In reality, this is the case most of the time: you go around collecting and labeling data, and you end up with a dataset, not two separate ones. For the base model, we again use Google’s BFN, InceptionResNetV2. Many tutorials use smallish networks such as VGG16 and ResNet50. I personally like big guns such as InceptionResNetV2. It is slower, but it gives me the peace of mind that I’m already using the strongest base model. Similar to our last tutorial, we’ll train our model with the popular Adam optimizer and cosine learning rate schedule. Next, let’s build our input pipelines for cross-validation. We do 5-fold CV; so, the size of the validation set val_sz should be 1/5 of the size of the entire dataset, data_sz. One small complication is that we put the validation set in a single batch, and to use the TPU our batch size has to be a multiple of 8, as the TPU has 8 cores. So, we round val_sz to the nearest multiple of 8, as follows. After that, we continue to use Folds 2, 3, and 4 as the validation set, respectively. After we finish all 5 folds, we’ll have a thorough evaluation of our model, with 5 different accuracy values. We have also built 5 instances of our model. In a deep learning competition, a common trick is to build an enemble with these 5 models to get slightly better test accuracy.